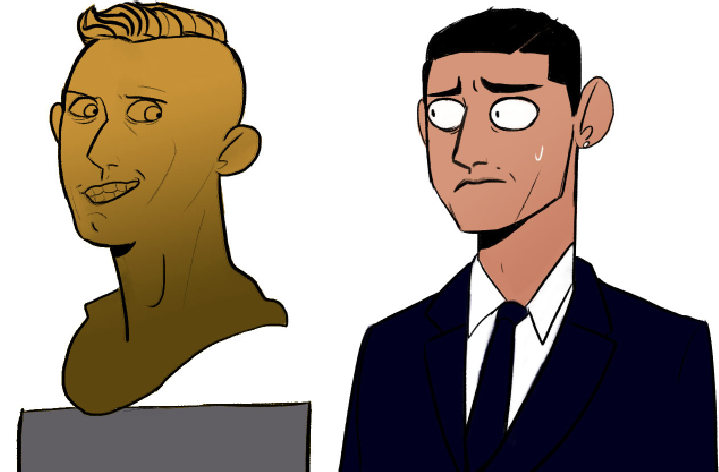 Terrible statues of Cristiano Ronaldo and other celebrities not only insult their likeness, but insult every single person that has to witness that kind of visual garbage. A statue was recently unveiled of the professional soccer player – or futbol player to the rest of the world that may be reading – Cristiano Ronaldo, the Real Madrid and Portuguese national team star. The horrific statue now graces the Cristinao Ronaldo International Airport in Madeira, the small Portuguese island where Ronaldo was born. The statue was widely panned, which is no surprise because a statue perfectly encapsulates the nightmare demon creature everyone’s subconscious has buried within. So, to commemorate the mediocre artists, the thousands of dollars they were probably paid and the civilians who had to gaze upon them, The Californian would like to go through recent history to appreciate these horribly made parodies of human life-like statues. Take a drive down to Columbus, Ohio, where most people go to see the botanical gardens and farmers’ markets. This site to see in downtown Columbus stands like a frozen tower of steroided beef, the metal statue of our former governor, Arnold Schwarzenegger, in his younger years. The statue originally was located in front of the Veterans Memorial Auditorium, commemorating the former bodybuilder’s 1970 Mr. World title. The statue quickly became a road trip attraction, as people going through town would stop to take a picture with the monster-like bronze creation. When the auditorium was bulldozed in 2014, the statue was moved downtown, but it continues to be a sight to be cringed at. Flexing in all his eight-foot-tall-deformed glory, his bulging veins make his bloodstream look like it is one big tapeworm. And that’s not even getting started on the muscle proportions, with approximately a 30-pack, anyone who didn’t know what the Govenator actually looked like would wonder why he didn’t just become the leader of the fifth dimension instead of California. Moving on, people who lived in the ’50s and owned a TV would often tune in to watch the beloved show “I Love Lucy”. The show was beloved by many, and was such an iconic American TVshow that the lead actress, Lucille Ball, had a park and statue dedicated to her in her hometown of Celton, New York. That statue was so terrifying, possibly ripped right out of the “Book of the Damned”, that the creator of it received death threats. The locals received an apology from the creator, and the statue was nicknamed “Scary Lucy”. Fortunately, with $20,000 and what would have been Ball’s 105th birthday, a new statue, more accurately capturing the beloved actress’s likeness, was revealed with great relief to the public. But it still stands next to the old statue, like a battle of darkness and light, shall fight each other in their appearance until the end of time. As the old saying goes, “art mimics life”, and while that can often result in breathtaking romanticization that are able to present the true beauty of the story that the human race behold, it can also mimic everything else. The mediocrity, the uncanniness, the unrealistic expectations, the horror! All of these elements and many more are perfectly reflected in the attempted manipulated mental and stone clumps that we call sculptures.